(Winston-Salem, NC, November 1, 2012) – Cover Story Media®, Inc. is excited to announce the launch of a new website brand, ConsumerGoodsAnalytics.com. 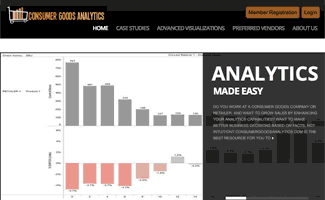 Consumer Goods Analytics is dedicated to showcasing advanced analytics case studies, articles and best practices, to help consumer goods companies advance their analytics competency. The company aims to help consumer goods’ companies grow sales by educating them on how they can use the right analytical tools to better understand and grow their business more strategically. “ConsumerGoodsAnalytics.com will become an online destination for consumer goods companies who are seeking to take a deeper dive into their data to make smarter decisions that will ultimately grow sales,” states Santiago Restrepo, Founder and Brand Manager for Consumer Goods Analytics.com. “We will share analytics case studies, best practices and tips to demonstrate how analytics can be used by experts in the consumer goods industry to increase sales and business,” says Restrepo. Cover Story Media, an online publishing company with multiple consumer-driven, web-based brands, is adding Consumer Good Analytics to its portfolio to expand into the new and growing online analytics space and reach new online readers in an industry they do not currently participate. Each of Cover Story Media’s websites is an online community that specializes in a unique interest area – from technology and analytics to pets and earth-friendly living – providing resources, news and tips. Cover Story Media®, Inc. is an online publishing company with multiple consumer-driven, web-based brands that specialize in original content in unique interest areas. Our websites are viewed as established resources that help millions of visitors each month find the solutions they are seeking. Readers are invited to interact and share their experiences in our web communities via discussion forums, blog comments, social media, e-mail newsletters and more. Based in Winston-Salem, North Carolina, we are a global group of highly skilled individuals who work from offices all over the world. From Texas and Peru to Ohio and Oregon, our team specializes in journalism, marketing, web development, search engine optimization, analytics, and cognitive science. We use these skills to help create an unforgettable web experience for our readers.